After killing them, make your way to the circular stone structure that dominates this chamber. 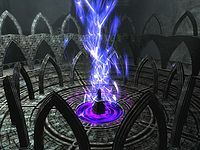 Pressing the button atop the pedestal in the center will cause a spike to emerge, impaling your hand as a purple light shines up from troughs in the floor. Push each of the movable braziers into or away from the center of the circle so that they touch the end of the purple light within their path, causing the pattern to expand towards the next brazier, until you connect them all. The center of the structure will then descend to reveal a stone monolith beneath the pedestal, which contains a mysterious woman carrying an Elder Scroll. Upon speaking to the woman, she will tell you that her name is Serana and that she is a vampire. She will ask you to take her to her family home, Castle Volkihar, northwest of Solitude. 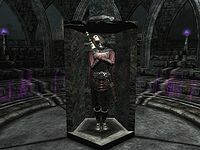 Asking her a few questions will reveal that she is not very trusting of you, but she does reveal that she has been imprisoned for a very long time, since even before the rise of the First Empire of Cyrodiil (i.e., about 4,200 years before current events). Once you finish your conversation with her, the quest completes and the next one begins. Serana will have unique dialogue if you are a vampire. She will assume that her father sent you, and if told that you were sent by the Dawnguard will remark that it doesn't sound like the name of a group of vampires. She will also note that the Dawnguard will eventually figure out what you are and turn on you. 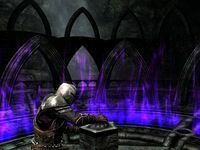 If you free Serana without killing the other vampires first, she will turn hostile towards them. When pressing the button in the center of the room, you may get stuck in a continuous loop of pressing the button. Sometimes you will be unable to speak to Serana. On rare occasions, Serana will not be in the monolith, and will only appear if you wait. Upon talking to her, she will begin walking away to an unknown location. This may be related to an issue with the Castle Volkihar entrance. ? Having a follower when opening Serana's sarcophagus may lead to a bug preventing A New Order from starting. It is advised to make a save before doing so and should the bug occur, dismissing any current followers as well as entering set playerfollowercount to 0 into the console, then proceeding as normal. ? This page was last modified on 29 December 2018, at 11:50.